Prisoners of Hope is written for real people who find themselves face down in the not-yet; of God. Standing in the difficult realities of your life financial needs, illness, troubled relationships you look to God. But your hope in Him has often been too small, limited by what you see in the moment, silenced by the voices of your enemies or human wisdom. 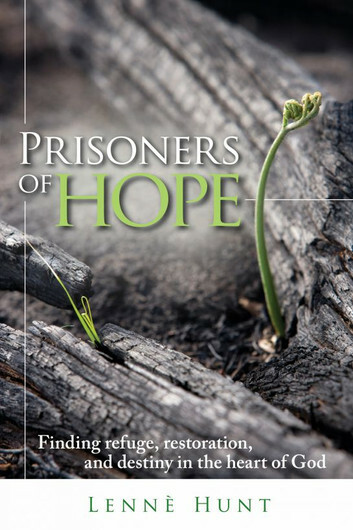 Reading through the pages of Prisoners of Hope, you discover: Your hope's foundation the name of the Lord. - The maintenance of your hope during the rigors of the not-yet. - The act of worship and faithfulness to a faithful God. Yes, you were made to live with extravagant, extraordinary hope that ushers God's glory into your circumstances. That hope must be as big as God's name, founded on a Father who pours Himself out on your behalf because as incredible as it may seem love has left Him ruined for you. Come and see more fully the heart of God, who has made you His delight and joy. Come and find extraordinary hope! The years spanning 2008 and 2009 have been perhaps the hardest of my life. They brought devastating heartbreak and loss, the kind that takes your breath away with such force that you wonder if you’ll ever breathe again. It’s bad enough when war comes at you through your enemy or through what often appear to be random circumstances. But when the blows are dealt by those you love, those with whom you are intimate, they result in a different kind of pain. It is the kind of grief I wouldn’t wish on my worst enemy. The result of the devastation has been that many of the things which served as moorings for my life have been torn away, and I find myself a bit adrift. Everything in my life is in flux, from finances to relationships to employment. I never dreamed that I would have to start my life over at this stage of the game, but this is the reality which faces me. I have been aware, in the midst of my own pain, that others were going through difficult circumstances as well. But I had no idea how widespread the trouble was. Not, at least, until recently. I was invited to attend a gathering hosted by a local women’s ministry. There were perhaps 30 women in attendance—a mixture of close friends, friendly acquaintances, and total strangers. As the night wore on, there was an opportunity for informal chatting as well as worship and testimonies. Driving home a few hours later, I realized that I had taken away two primary impressions from the night. The first was that I felt absolutely stunned by the stories I had heard. Every person I talked to or heard speak had told a story of profound stress, loss, or threat. Some were on the verge of losing their homes—victims of an economy in trouble and the bust in the real estate market. A few of the women had lost jobs or had spouses lose jobs, while others lived with the ever-present threat of layoffs. Some were struggling with profound marital distress ranging from recent divorce to relationships on the rocks to the pain of living in lifeless marriages devoid of intimacy or love. Then there were those who had family members serving in harm’s way in the military. And of course, there was the usual assortment of women who were caring for elderly parents or raising challenging kids. Trouble was everywhere for everyone. That theme is echoed around our world. No continent or country is immune as it dawns on us with increasing awareness that we are all interrelated. A stock market cannot struggle in one nation without affecting the global economy. There is no such thing as a regionally contained war. We’re all breathing the same air, subject to the same weather patterns, feeling the same anxiety. Watching the news these days ought to come with hazard pay—to be done only by the stout of heart or the heavily medicated. Such is the emotional climate of our day. It is driven by the winds of uncertainty as so many of the things we have trusted in come crashing down around us. The carefully planned for future has disappeared right along with the value of our IRAs. And the present is lived moment to moment, doing the best that we can. In the U.S., we have tried to pretend that voting in a new president would help—that somehow his inauguration would work quick magic to steady the economy and calm global unrest. Many of the world’s governments have scrambled to put together bailout plans and shore up crumbling financial institutions or bankrupt industries. We’ve consulted experts and prognosticators. We’ve tried denial, reactionary panic, and antidepressants. It isn’t helping. None of it is. And so the questions of the hour are these: Is there any sure thing, any real hope that goes beyond mere wishfulness? What or who has the power to truly comfort us, heal us, restore us? Where does our help come from? Fortunately, the answer is as resounding as the questions. Our help comes from the Lord, the Maker of Heaven and earth (see Ps. 121:1-2). And that was the second impression I gained from the meeting I attended. On the heels of all the tragedy and desperate need came the stories of the Lord, strong and mighty, God who loves us so much He has engraved us on the palms of His hands. Getting through this time will require having more of God than we have known up until now. Praying the same old prayers and doing the same old religious things won’t do it. We need exactly what Paul prayed for the Body of Christ at Ephesus, that “the glorious Father may give [us] the Spirit of wisdom and revelation, so that [we] may know Him better…that the eyes of your heart may be enlightened in order that you may know the hope to which He has called you…” (Eph. 1:17-18). This book is about that hope—the kind that actually has power to help in times of great despair and uncertainty. The kind that is rooted and grounded in the very Person of God. When all that I know is overtaken by the mystery that is God, when understanding ceases and all I have are questions and needs, it is then—especially then—that I must know that God is good. Not the kind of knowing that is mere intellectual assent or theological doctrine. And not the kind of good that exists only in some generic way or only for other people but not for me. Hope can only exist when it is grounded in the certainty that all God does with respect to my life, He does in the service of love. Love that is passionately, deeply, unreservedly, unwaveringly for me. He cannot, will not abandon or reject me. God is never unaware or uncaring of my plight. Nor is He ever passive. This kind of hope will require some things of us—things that are sometimes difficult and outside the box we’ve been accustomed to. You may not know yet that God is good. You may not be convinced that He loves you or will come to your aid. That’s OK. True faith is usually the end result of a journey that began with some measure of doubt and uncertainty. Knowing God is an unending process that advances only by engaging in relationship with Him, even if that relationship occasionally looks more like a wrestling match than a love affair. It is my prayer that this book will provide help in both knowing God better and in walking in the hope that flows from that. Like Paul, “I pray that you, being rooted and established in love, may have power, together with all the saints, to grasp how wide and long and high and deep is the love of Christ, and to know this love that surpasses knowledge—that you may be filled to the measure of all the fullness of God” (Eph. 3:17-19). I invite you to join me on the journey that we all share to find truth and hope and direction. The following chapters will address what hope is and where it can be found. We will look together at what hope requires of us and the steps that are necessary to safeguard it. And we will discover the fruit of hope—what happens when we dare to take a stand based on the goodness of God rather than on the appearance of our circumstances. Nothing that I’ve written here has come cheaply or easily. It has been forged in the trials of my own life. In those trials, I have often felt like Jacob, wrestling with a God I did not understand or fully trust. What I’ve come to know is the same lesson that Jacob learned. God’s intention all along has been to bless me and love me. To give me a future and a hope. The same is true of His intention toward you.